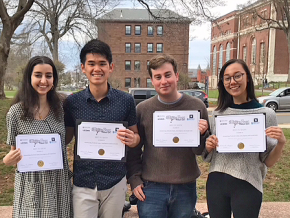 69 search results for "naegele/"
Three Wesleyan students will conduct laboratory research in India this summer as recipients of the U.S. Department of Education’s Undergraduate International Studies and Foreign Language Program (UISFL) grant. 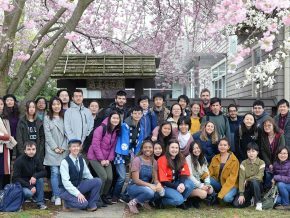 Claire Glickman ’21, Guadalupe (Lupita) Sanchez ’20, and Jaye Jeong ’20, will work at the Tata Institute of Fundamental Research (TIFR) in Mumbai. Their grants are being administered by the College of Integrative Sciences, with support from the Fries Center for Global Studies. Wesleyan received the two-year $165,699 grant to support the teaching of Hindi and Urdu, the research of STEM faculty and students in India, and the increase of cultural programming related to South Asia. 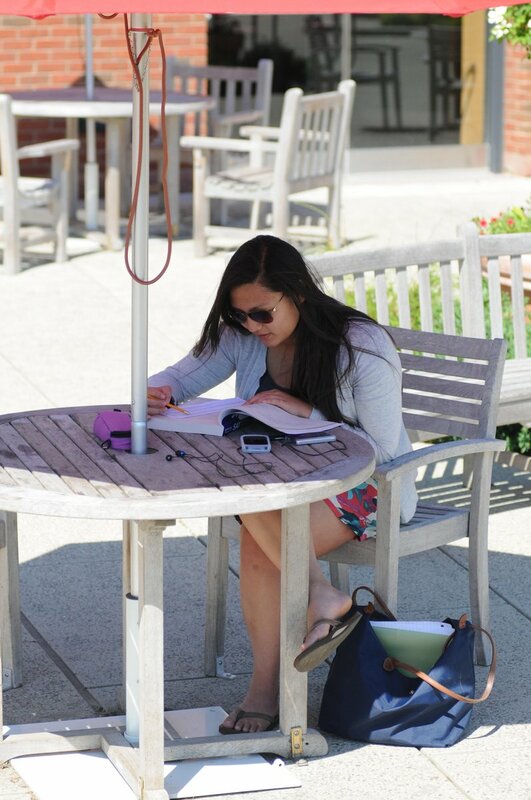 The grant funds 50% of the total expenditures to which Wesleyan is committed over the two-year life of the grant, with the remaining 50% ($165,699) coming from nongovernmental sources. 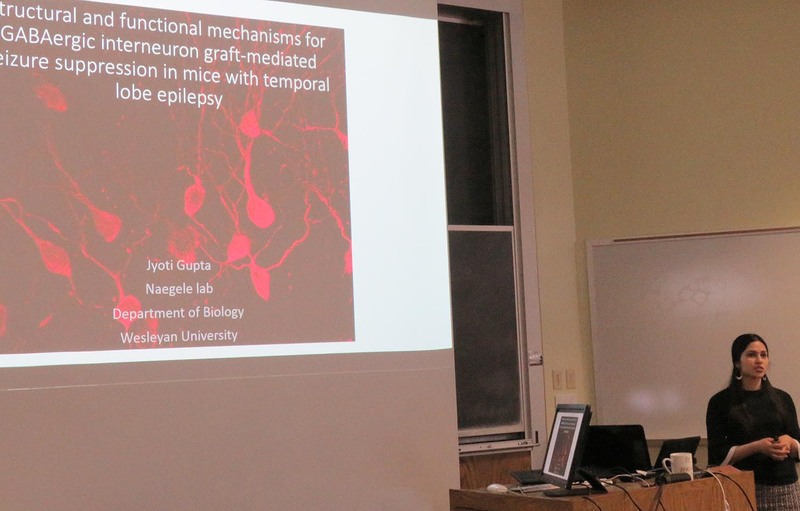 Jyoti Gupta, who earned her PhD in biology in 2018, is pictured presenting her dissertation defense at Wesleyan. Gupta is the lead author on a recently published study that investigates abnormal neuron growth in mice that have temporal lobe epilepsy. Adult neurogenesis, a process whereby new neurons are added to the brain, is thought to be confined in mammals to just a few regions, including the hippocampus, a structure important for learning. Whether this process occurs in the adult human brain is controversial, but in most other mammals that have been studied, adult neurogenesis in the hippocampus appears to be essential for forming memories. Producing new neurons in the adult hippocampus is regulated by the environment, mood, exercise, diet, and disease. In some forms of epilepsy, the production of new cells in the hippocampus, called granule cells, becomes highly abnormal and the altered neurogenesis is thought to increase over-excitation and exacerbate seizures. Laura Grabel, pictured at far right, is one of 11 women in the state of Connecticut to receive a Women of Innovation® Award. 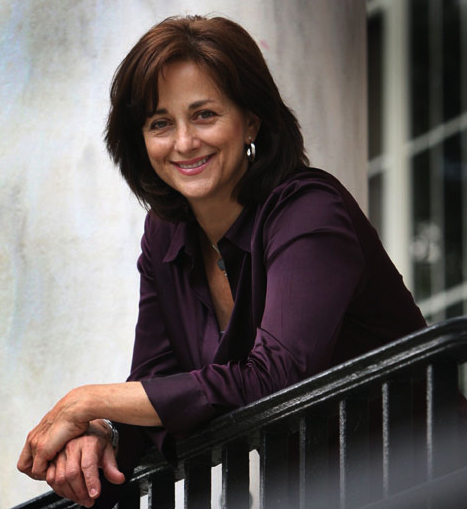 Laura Grabel, the retired Lauren B. Dachs Professor of Science and Society, received an award at the 15th Annual Connecticut Technology Council Women of Innovation® Awards presentation on March 27. The Women of Innovation® program recognizes women innovators, role models, and leaders in science and technology professions, as well as outstanding young women at the high school and collegiate level pursuing technology studies. Of 50 finalists, 11 were recognized as winners in their respective categories; Grabel took the top spot in the Academic Innovation & Leadership (Postsecondary) category. Grabel, who also is a retired professor of biology, is an accomplished scientist engaged in understanding how the fertilized egg can become a complex organism. This spring, she is teaching Reproduction in the 21st Century. Naegele in The Conversation: Are Neurons Added to the Human Brain after Birth? Wesleyan faculty frequently publish articles based on their scholarship in The Conversation US, a nonprofit news organization with the tagline, “Academic rigor, journalistic flair.” Janice Naegele, the Alan M. Dachs Professor of Science, writes about the implications of a controversial new neuroscience study from the University of California, San Francisco. 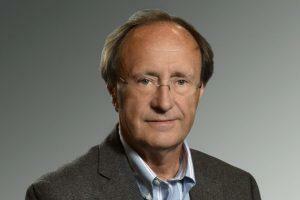 Naegele also is professor of biology and professor of neuroscience and behavior. Read her bio on The Conversation. Scientists have known for about two decades that some neurons—the fundamental cells in the brain that transmit signals—are generated throughout life. But now a controversial new study from the University of California, San Francisco, casts doubt on whether many neurons are added to the human brain after birth. 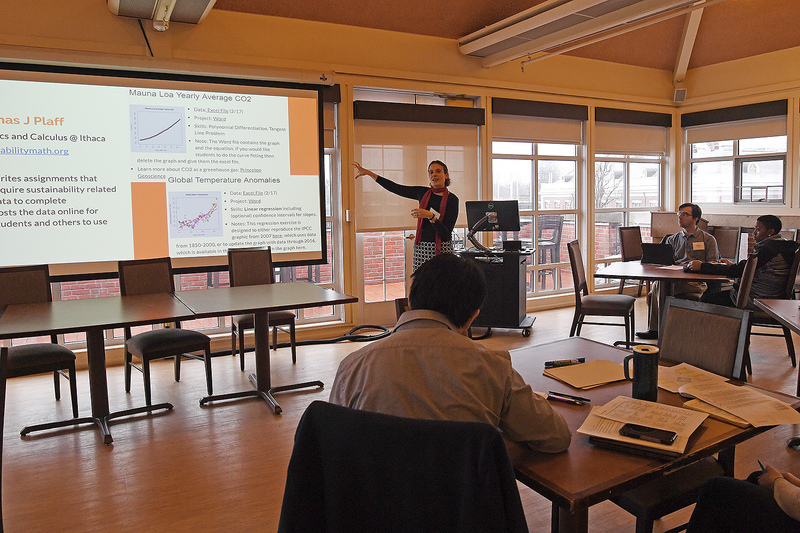 Sustainability Across the Curriculum, a Jan. 23 workshop organized by Wesleyan’s Sustainability Office and the Center for Pedagogical Innovation, provided faculty and instructors with the opportunity to discover ways to integrate sustainability into a variety of courses across academic disciplines. 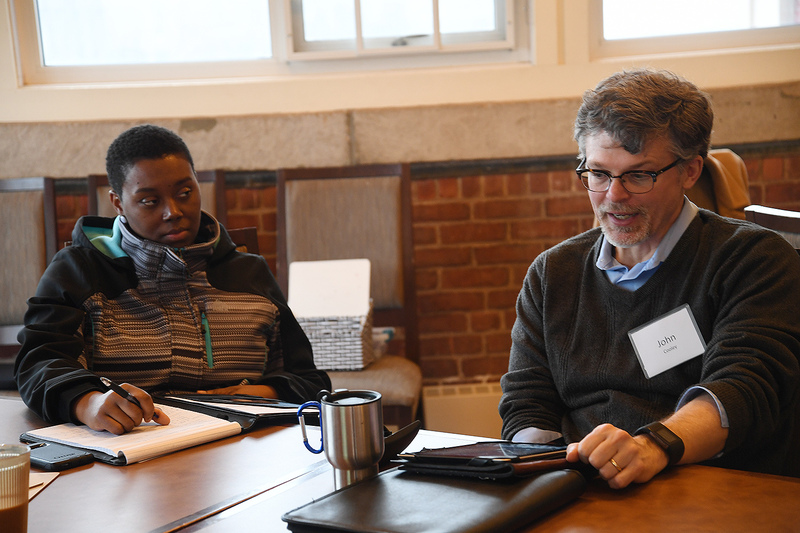 The workshop featured a panel highlighting work by faculty who participated in the first year of Sustainability Across the Curriculum and had integrated sustainability into their own courses, followed by small-group sessions offering brainstorming opportunities. The focus of the SATC program is to amend an existing course to include sustainability, explained Jennifer Kleindienst, Wesleyan’s sustainability director, “The groups were divided into individuals who are early in this journey (not sure where to start) and those with an idea but looking to clarify details.” Kleindienst was there to facilitate discussions, along with Professor of Earth and Environmental Science Suzanne O’Connell, faculty coordinator for Sustainability Across the Curriculum, and assistant Ori Tannenbaum ’20. She notes that the full program includes this workshop along with four seminars later in the semester, and then course integration over the next year. Following that, the faculty cohort reconvenes to discuss their experiences. Kleindienst invites the community to view the program website or contact her or Suzanne O’Connell with questions or for further information. 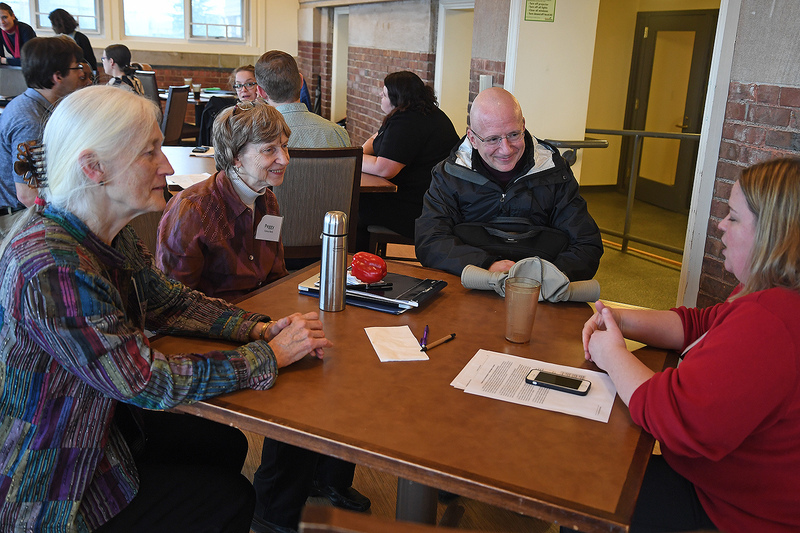 The event’s faculty panel offered information on ways they’ve approached sustainability issues within their own curriculum. Panelists included past Sustainability Across the Curriculum participants Tony Hatch, associate professor of science in society, associate professor of African American studies, associate professor of sociology; Jan Naegele, the Alan M. Dachs Professor of Science, professor of biology, professor of neuroscience and behavior; and Elise Springer, chair and associate professor of philosophy, associate professor of feminist, gender and sexuality studies. Hatch noted he had pursued the subject of sustainability in terms of biomonitoring—that is, what elements are now in the human body that were not found there in previous eras. Naegele spoke about adding a module to the course on brain development that considered the effect of neurotoxins on that process. And Springer noted that sustainability is not a goal that can be fully achieved, but a genre of critique that evolves as we understand the ecological complexity of our practices. 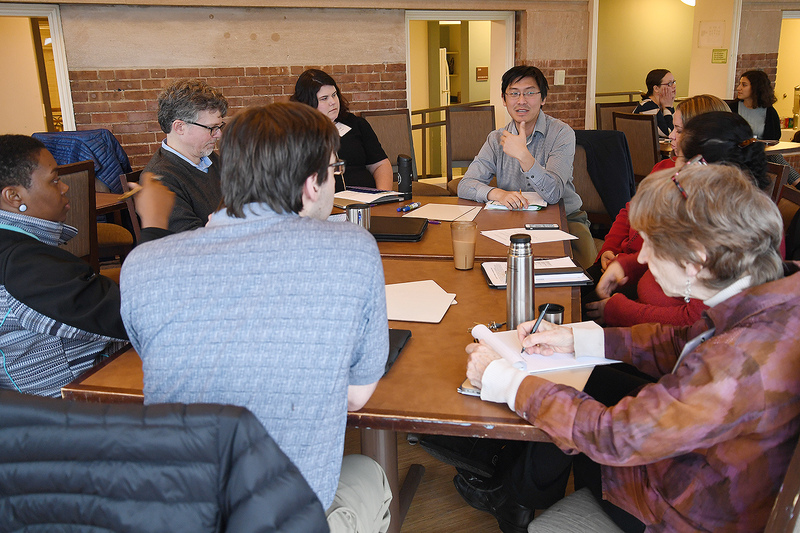 Ying Jia Tan, assistant professor of history, whose research focuses on the history of energy in modern China, participated in the brainstorming session. Rachael Barlow, Wesleyan’s first associate director of assessment, who teaches the courses associated with the university’s new integrative learning project, also joined the seminar as a facilitator, offering examples of sustainability courses designed at other institutions that have proven successful. 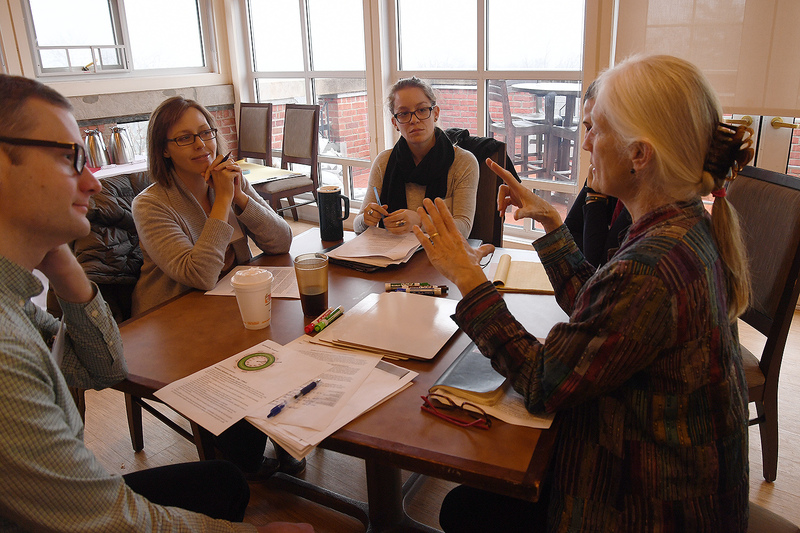 Facilitator Suzanne O’Connell (right), professor of earth and environmental sciences and an early adapter to introducing sustainability concepts in her classes, shares teaching techniques that she has found effective in approaching the topic. 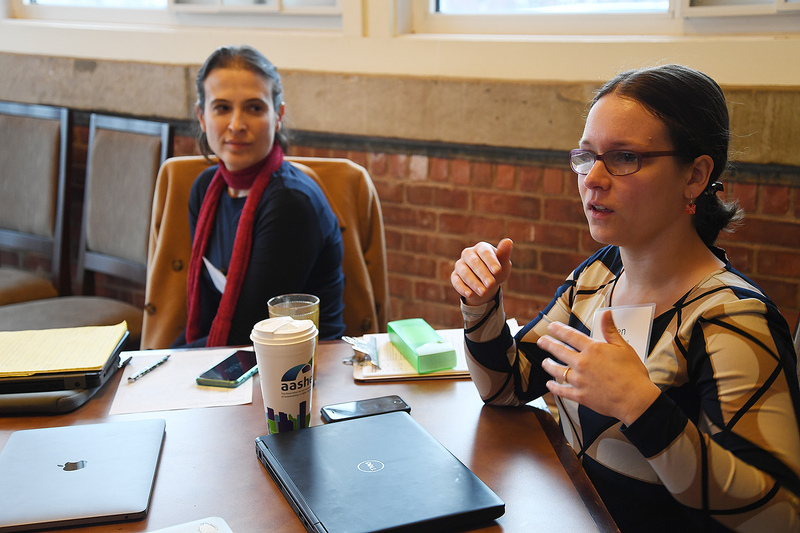 Constance Leidy (right), associate professor of mathematics, noted that she found it important to help students visualize extremely large numbers in order to contemplate the effects of exponential growth in population versus available resources. 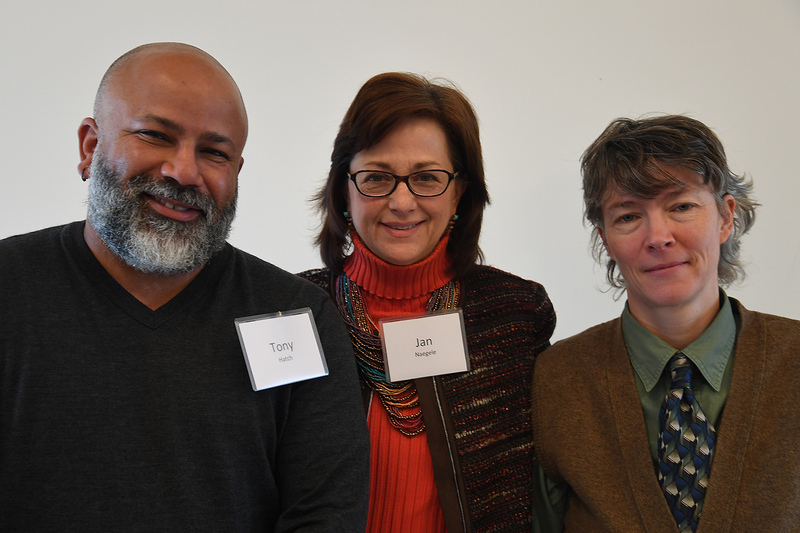 (From left to right, Suzanne O’Connell, professor of earth and environmental science; Peggy Carey Best, director of service learning and visiting assistant professor of sociology; and William Johnston, professor of history, East Asian studies, science in society, and environmental studies. 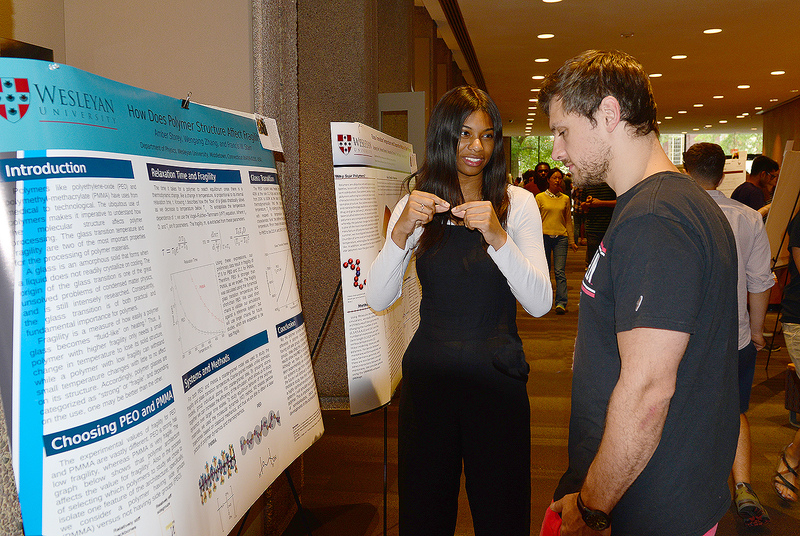 More than 120 undergraduate research fellows shared their summer and ongoing research during the Wesleyan Summer Research Poster Session held July 27 in Exley Science Center. 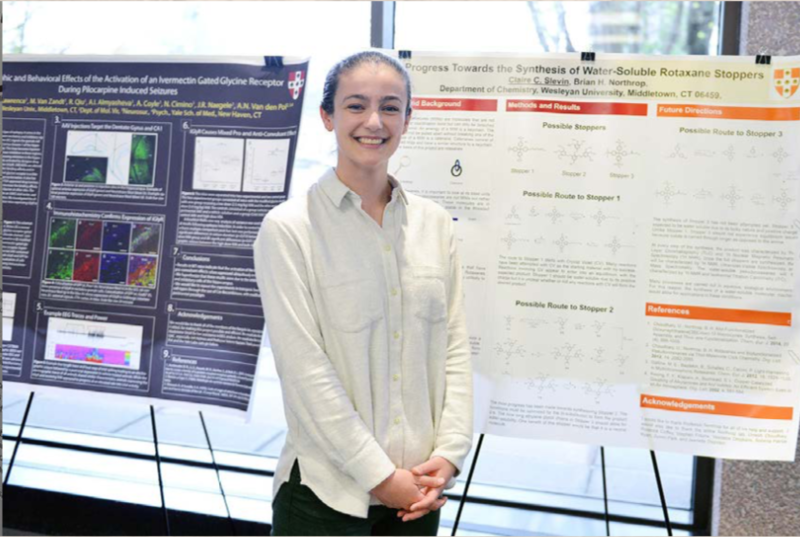 Amber Storey ’18 presented her physics research titled “How Does Polymer Structure Affect Fragility?” Her advisor is Francis Starr, professor of physics, professor of integrative sciences, professor of molecular biology and biochemistry and director of the College of Integrative Sciences. Joe Knee, professor of chemistry and dean of the Natural Sciences and Mathematics Division, is receiving the Beach Professorship of Chemistry, established in 1880. Janice Naegele, professor of biology, is receiving the Alan M. Dachs Professorship of Science, established in 2011. Stewart Novick, professor of chemistry, is receiving the Joshua Boger University Professorship of the Sciences and Mathematics, established in 2010. 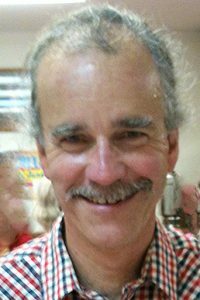 Christopher Parslow, professor of classical studies, is receiving the Robert Rich Professorship of Latin, established in 1863. Irina Russu, professor of chemistry, is receiving the E. B. Nye Professorship of Chemistry, established in 1908. Professor Stephen Devoto spoke at the StemConn 2017 conference, held April 27 in New Haven, Conn. 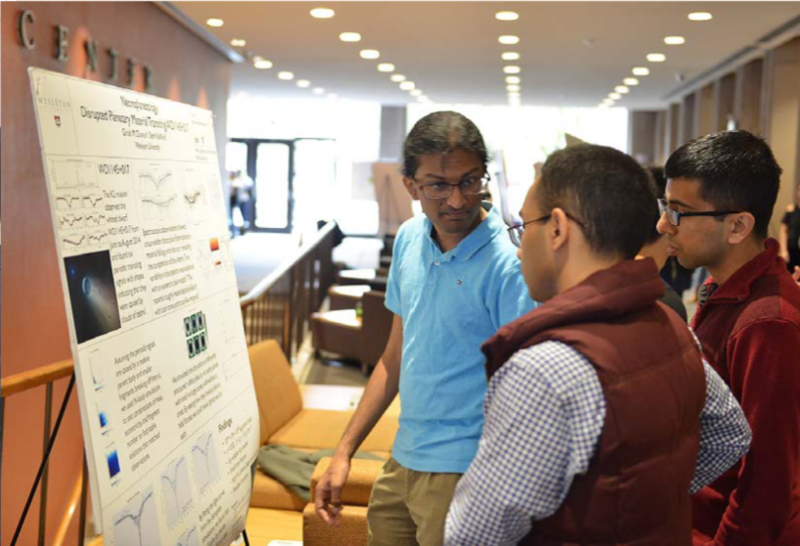 The annual StemCONN conference, held April 27 in New Haven, made clear that Connecticut’s commitment to stem cell research has helped the state become a national leader in this burgeoning area of research and commercial development. 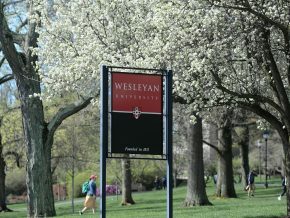 Wesleyan is one of the founders of the StemCONN conference, along with Yale and the University of Connecticut. This year marks the 6th StemCONN conference, an event that brings together more than 500 individuals from academic institutions, bioscience industry, and government. Connecticut passed ground-breaking legislation in 2005, becoming the first state to fully approve funding for stem cell research. The 12-year, $100-million per year initiative has enabled the state to compete successfully for scientific talent in the field and has helped to establish a growing bioscience corridor in the Hartford-New Haven area. 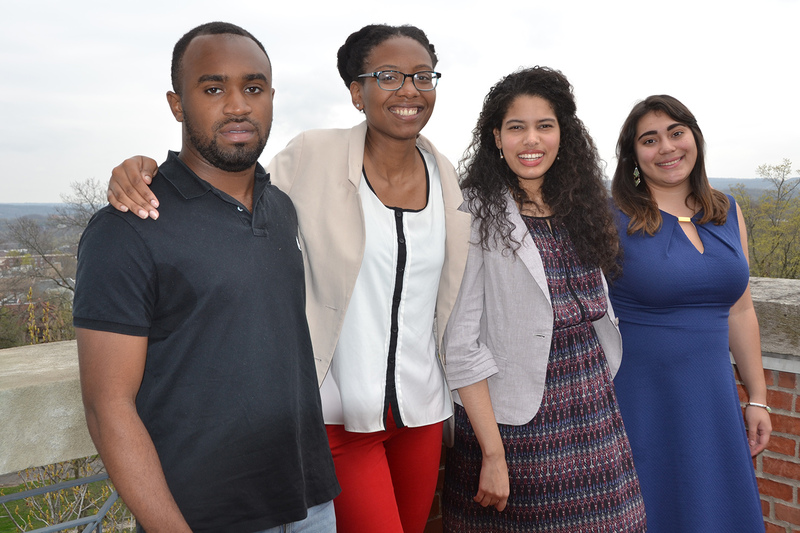 The Senior McNair Fellows who spoke on April 18 are part of the cohort of 10 who are presenting their undergraduate research projects this year. From left to right: Nicholas Morgan ’17 (majoring in economics), Stacy Uchendu (majoring in chemistry), Hanna Morales Hernandez (majoring in chemistry) , and Cindy Flores (majoring in earth and environmental science). This spring, the 10 McNair Fellows of the Wesleyan Class of 2017 are presenting their undergraduate research projects at Senior Talks on Thursdays at noon from April 18 through May 4, in Allbritton 311. 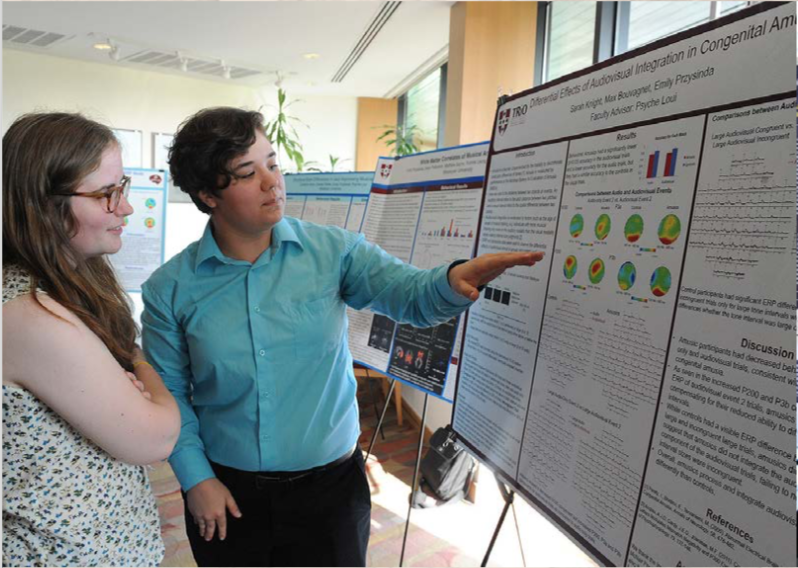 The presentations describe the research that students have conducted with Wesleyan faculty mentors. Many of these projects also are the subject of student theses or final papers presented for the Wesleyan BA requirements. 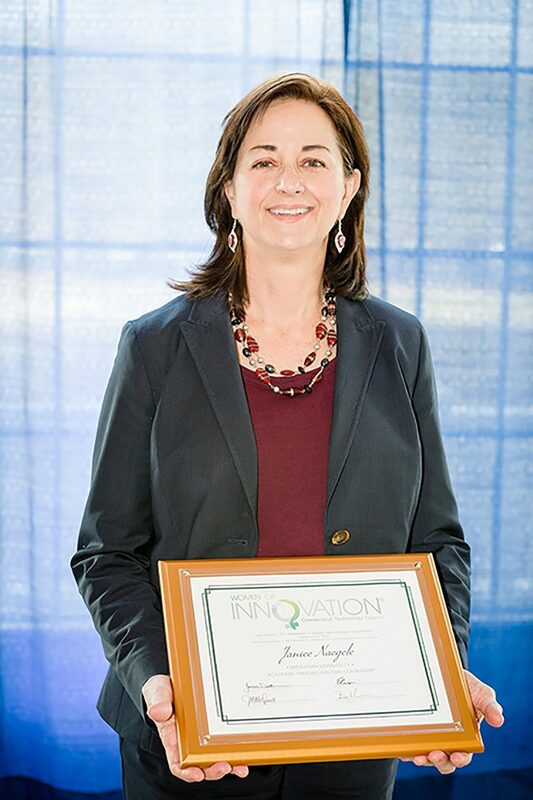 Jan Naegele accepts her “Women of Innovation” award. Naegele, professor of biology, professor of neuroscience and behavior, was honored during the “Women of Innovation” awards dinner, held March 29 in Plantsville, Conn. The award recognizes women accomplished in science, technology, engineering, math and those who are involved in their community. Naegele is a developmental neuroscientist whose research seeks to identify novel treatments for epilepsy and brain damage. She has published extensively on applications of stem cell transplantation for neural repair, including articles on embryonic stem cell therapy for treating epilepsy and the synaptic mechanisms underlying seizure suppression by fetal inhibitory neuron transplants. In the Naegele Laboratory, a team of graduate students, working with undergraduates and technicians, investigates the therapeutic effects of stem cell transplantation through experimental approaches including behavior, electrophysiology, immunohistochemistry, viral-mediated gene overexpression and optogenetics. 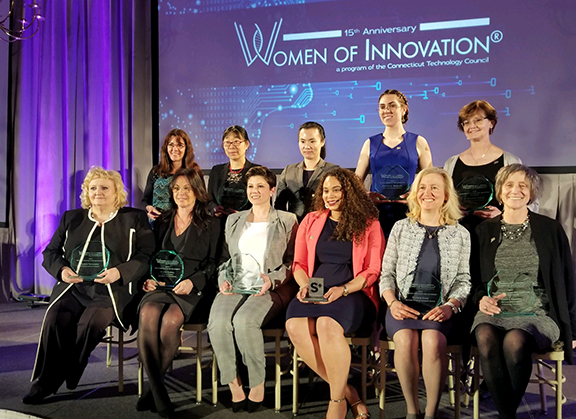 The Connecticut Technology Council received more than 200 nominations for the Women of Innovation® awards. 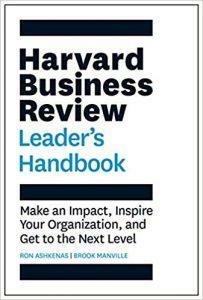 Nagele was one of three women named a finalist in the Academic Innovation and Leadership-College category. Wesleyan’s Antonio Farias, vice president for equity and inclusion; Joyce Jacobsen, provost and vice president for academic affairs; Ishita Mukerji, the Fisk Professor of Natural Science, professor of molecular biology and biochemistry; and Joe Knee, dean of the Natural Sciences and Mathematics division, professor of chemistry, nominated Naegele for the award. 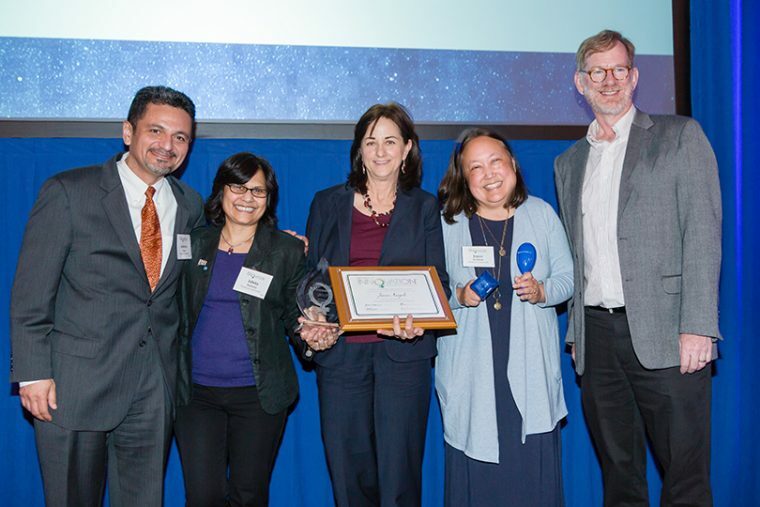 From left, Antonio Farias, Ishita Mukerji, Jan Naegele, Joyce Jacobsen and Joe Knee attended the Connecticut Technology Council’s “Women of Innovation” awards dinner on March 29. Naegle, who came to Wesleyan in 1991, has served as chair of the Biology Department, director of the Center for Faculty Career Development, and as vice chair of the faculty. 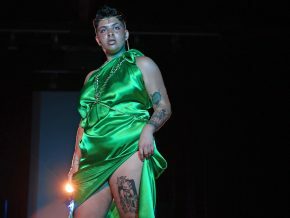 Her work is funded by the Connecticut Regenerative Medicine Research fund, the National Institutes of Health, and CURE Epilepsy. Recent honors and awards include the Louise Hansen Marshall Mentoring Award from the Society for Neuroscience; election to the Connecticut Academy of Science and Engineering; and completing a one-year fellowship in the ELATE at Drexel women’s executive leadership program. 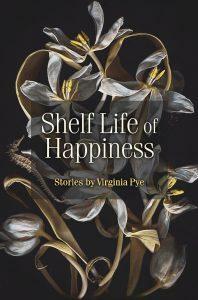 Read more News @ Wesleyan articles about Professor Naegele. 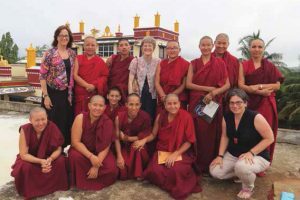 In June, Jan Naegele, professor of biology, professor of neuroscience and behavior, traveled to Mundgod, India to teach Tibetan monks through the Emory-Tibet Science Initiative (ETSI), a program promoting “the convergence of science and spirituality as two complementary systems of knowledge,” according to the Emory Tibetan Partnership. 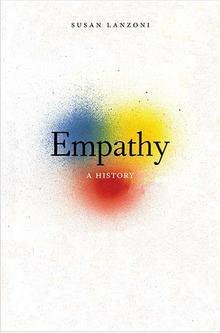 ETSI was founded as a pilot in 2006 by Emory University at the bequest of the 14th Dalai Lama. Naegele’s journey, which she took together with her husband, Dr. Paul Lombroso, was described in the Winter 2016 issue of Rutland Magazine, in an article featuring many photographs provided by Naegele. Janice Naegele, professor of biology, professor of neuroscience and development, is the co-author of a new paper titled, “Convulsive seizures from experimental focal cortical dysplasia occur independently of cell misplacement.” It was published in Nature Communications on June 1. Brain malformations called focal cortical dysplasia are typically formed during human embryonic cortical development and are a common cause of drug-resistant epilepsy and cognitive impairments. One of the causes of cortical dysplasia is improper migration of developing cortical neurons. Failure to reach their correct destinations in the cerebral cortex and dysregulated growth leads to the formation of growths or tubers in regions of cerebral cortex. These abnormal growths don’t wire up properly with other cortical neurons and exhibit seizure activity. In this multi-lab collaborative study, the researchers show in mice with experimentally-generated cortical malformations that there is an increase in growth-associated signaling molecules in experimentally-generated cortical tubers associated with seizures. Blocking this signaling cascade with the molecule rapacycin from early stages can prevent the neuronal misplacement, tuber-like growths, and seizures, but once rapamycin is discontinued, the seizures return. Despite the adverse side-effects of taking rapamycin, these findings suggest that life-long treatment with rapamycin may be required in individuals with focal cortical dysplasia, in order to prevent the re-occurrence of seizures and tubers. The paper is co-authored with Felicia Harrsch, Naegele’s former lab manager, and researchers at the Yale University School of Medicine.